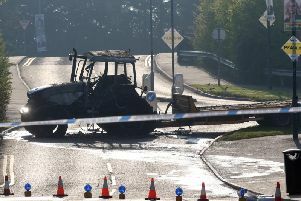 Police in Lisburn are appealing for information after a fire extinguisher was stolen aT Sprucefield before Christmas. On December 22, 2015 at 3am, an adult male aged approximately 20 – 25 years and descried as being of medium build, with short dark hair, wearing blue jeans, a white shirt and a school tie, stole a fire extinguisher valued at £300 from McDonalds at Sprucefield. The police have reported that the male had arrived at the food outlet on a coach from Banbridge with other adults, both male and female, dressed in school uniform. The group are believed to be associated with young farmers from all over Northern Ireland. The suspect in the theft is suspected to reside in the Hillsborough or Moira area. He left the scene in a blue van driven by another male whom police wish to speak to also in relation to the theft. Anyone with any information regarding this incident can contact Constable Green at Lisburn PSNI on the non-emergency number 101. Information can also be passed to the police anonymously by contacting Crimestoppers on 0800 555 111.